DOW tester Josh Simpson headed to the Auckland/Waikato border to have a look at the Calibre Performance Package from JB Attachments. Being versatile and efficient is just two of a long list of requirements needed to run a successful contracting company. 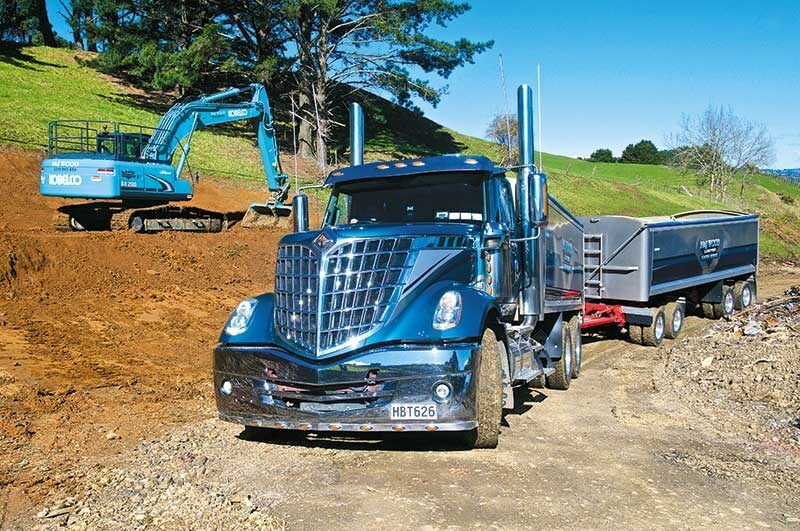 No one knows this better than Neil Wood and son Ryan from N&J Wood Limited, a well-known earthmoving, cartage and cleanfill business situated atop the Bombay Hills on the southern fringe of Auckland. 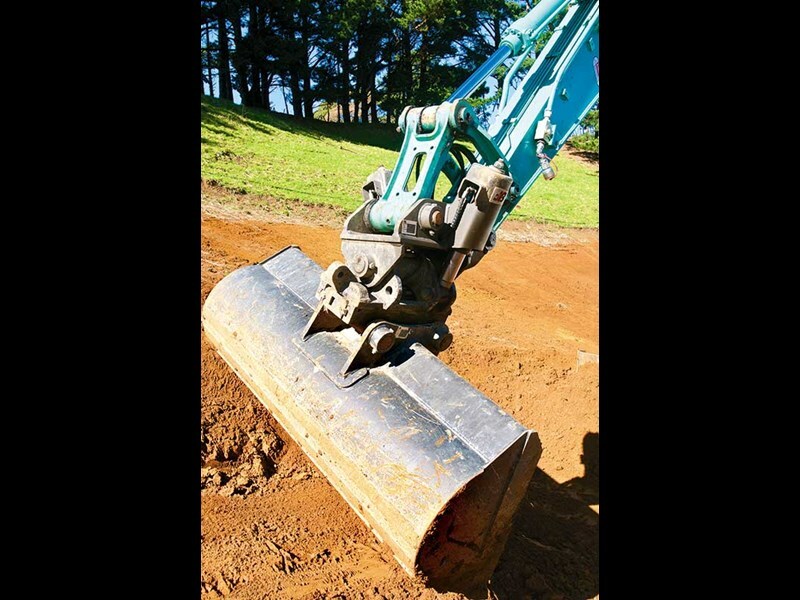 When the business acquired a new 13-tonne excavator back in December 2015, the partnered tilt-coupler they received with the machine seemed like a good fit at the time, but it didn’t take long before some problems started to arise. 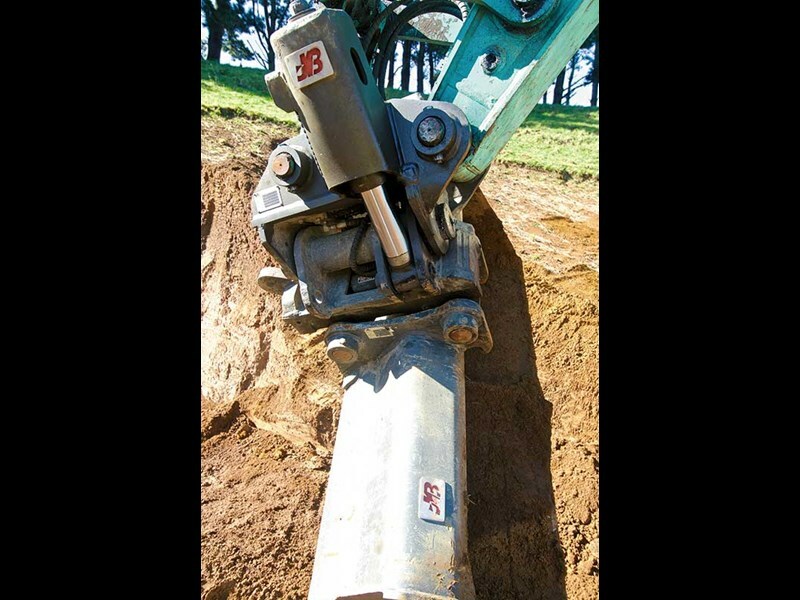 The Woods say that after continuously being let down by the lightly-built tilt-coupler it was decided that they would go back to the name they knew and could rely on; JB Attachments. With the company’s previous 12-tonne excavator having 13,000 hours on the clock and not once having a problem with its JB tilting coupler, the brand choice is said to have been a clear-cut one. So, three months after installing the first Calibre Performance Package on the first machine, N&J Wood decided to give their smaller Kobelco SK135SR the same treatment. The Calibre Performance Package consists of three primary pieces and is marketed as a smooth all-in-one combination of the, Calibre Ram-Tilt Coupler, the Calibre Smart Valve and ‘new’ Calibre Wide Bucket; so essentially a package that contains a quick-coupler with, bucket tilt-mechanism and wide bucket, all integrated into one complementary unit. After driving down through the N&J Wood cleanfill site to where the machines are parked (one of the first times this year that both machines are in the yard), we are quickly into it; meeting Adam Franklin from JB Attachments who gives us a run-through on the Calibre Performance Package. The first thing to be pointed out is the ‘Calibre Smart Valve’ hydraulic block, which controls the Ram-Tilt Coupler’s tilt mechanism. 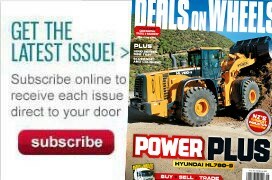 This is conveniently tucked away on top of the Ram-Tilt Coupler out of harm’s way—but still easily accessible. This block is essentially the ‘brain’ of the package with hydraulic lines connected straight into the top of the unit; making for an easy and cost effective installation. Connecting directly to the tilting rams, the Calibre Smart Valve block contains all the hydraulic controls, that in turn gives immediate responsiveness and cuts out the run-on micro-travel operators get when stopping the tilt action. This feature makes it easier to get that ideal angle when making a cut. With this latest Calibre Ram-Tilt Coupler design, JB Attachments have included a double-locking safety system; this being a lock in the front and also a lock in the rear—both keeping the unit fully compliant with all industry regulations worldwide. 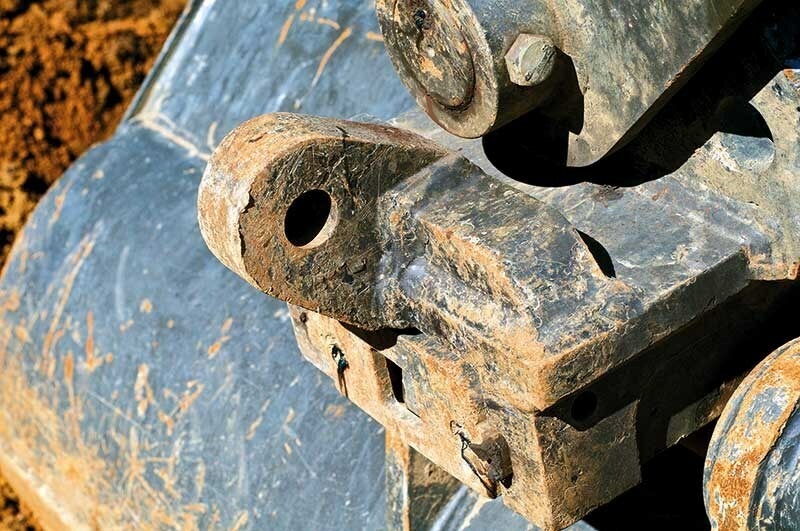 Looking at the lifting eye on the coupler, it is pointed out that unlike many competitors who simply weld a lifting eye onto a plate and only certify that part, JB Attachments have incorporated theirs into the coupler itself and certify the entire Multi-Coupler structure for lifting. Along with the other pieces of the Calibre Performance Package, I am told that the Ram-Tilt Coupler has gone through a rigorous design-and-build process; this included being verified by independent engineers. Part of this included an analysis by pulling on the lifting eye and hitch, stretching the coupler to find its breaking-point; with any weaknesses then addressed and remedied. The new design has created an even safer, strong and reliable Ram-Tilt Coupler. One coupler from every batch processed during manufacturing is also tested on JB Attachments own in-house calibrator pull test rig, where it is tested to two times the (WLL) working load limit. The Calibre Wide Bucket (1800mm) has been redesigned to provide more breakout force and offers the same capacity as JB Attachments traditional 2000mm bucket. Franklin says that the additional breakout capability from the new version can reduce the need to swap over to a rock bucket when working on harder material and in Wood’s case, has a potential saving of two to three hours a day. 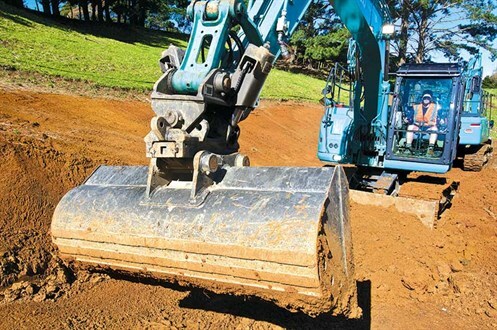 The new Calibre Performance Package attached to the N&J Wood Kobelco SK135SR excavator has been calculated to have over two–tonnes more digging force over the competitor’s tilt-coupler that was previously on the machine; the extra strength being something that Ryan Wood said he definitely noticed. As the slightly narrower Calibre Wide Bucket has the same capacity as their 2000mm wide bucket, it also means that loading efficiency can be maintained; working out at something like a reduction of three passes per six-wheeler truck load. It may not sound much, but over the course of a day, a week and more importantly a year, fuel savings for owners could be substantial. 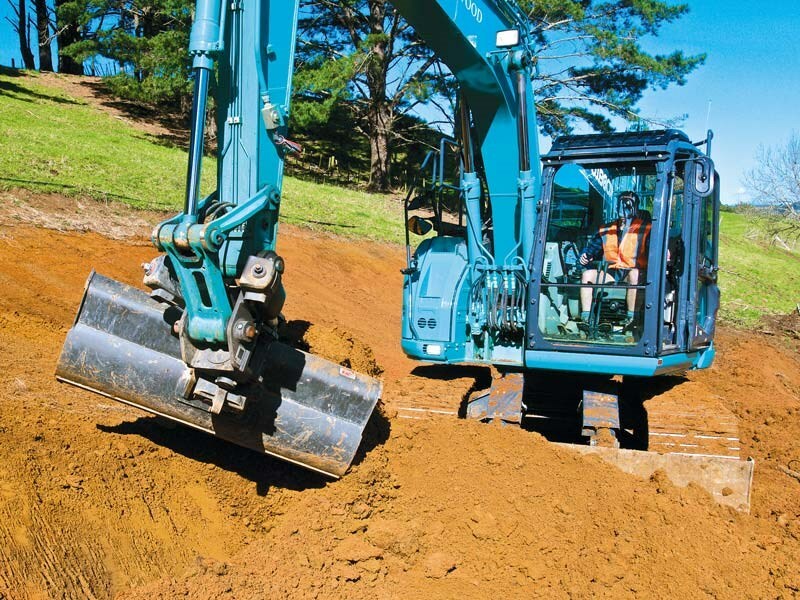 It was time to put the Calibre Performance Package through its paces on the Kobelco SK135SR to see what I thought. Finding some virgin clay to dig in I quickly get down to work. 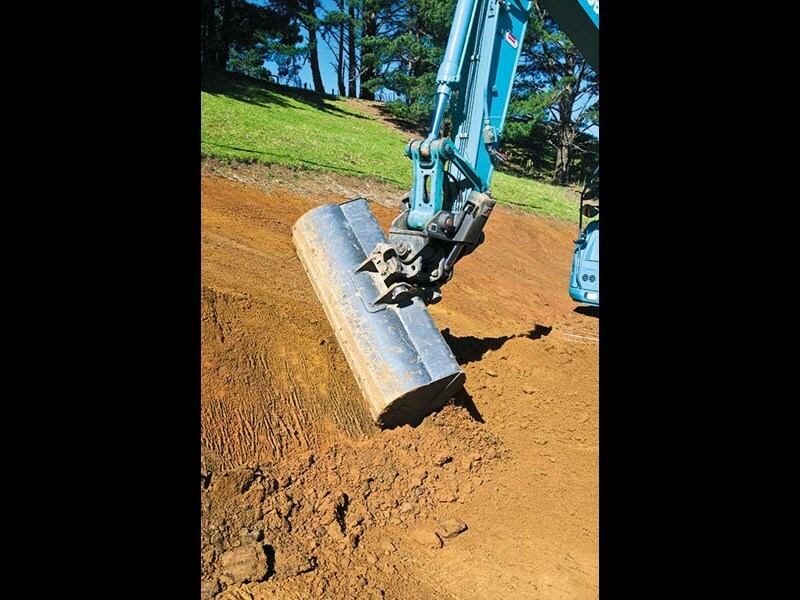 I was impressed with the digging force of the 1800mm wide Calibre bucket and could understand how the three parts of the Calibre Performance Package come together into one single unit. The 45 degree range of the Ram-Tilt Coupler itself easily allows for pretty much everything that a contactor would require on a job from a tilt mechanism—although some operators always want more, more, more. The connected Calibre Smart Valve allows for some of those precise tilt movements that are constantly needed when digging and certainly does away with the micro-travel that are experienced on other tilting mechanisms. 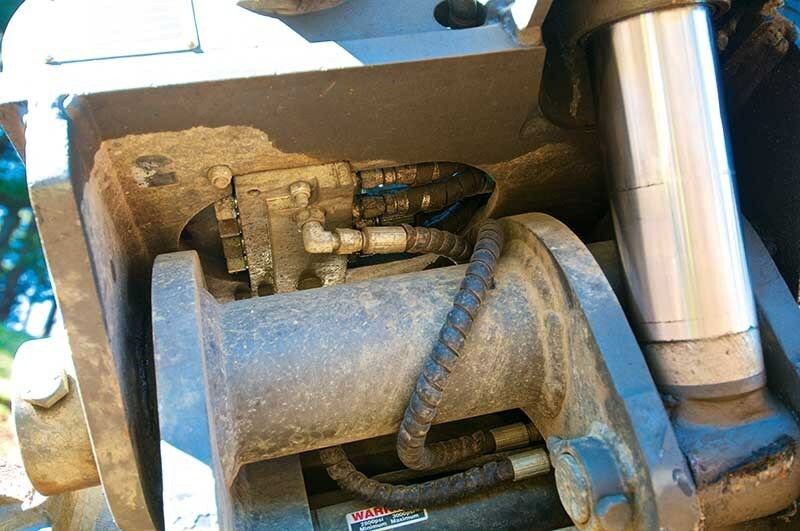 One thing I did notice was a machine-shudder as the Ram-Tilt Coupler came to its sudden-stop and assume that this was due to the stopping efficiency of the hydraulic unit. Putting this down to my unfamiliarity with the toggle-switch set up in the machine, I’m confident that this would not be a problem once I had a few more operating hours under my belt. After running the unit through its paces and being thoroughly impressed, I thought I’d also check to see how accessible the greasing points were as I know these can sometimes get a bit neglected, especially if they are hidden behind things. 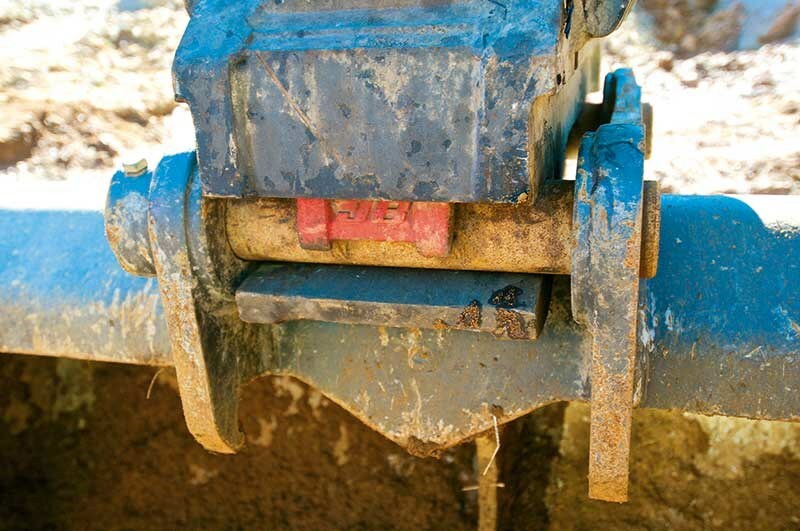 Franklin says that because the whole coupler is ‘tied’ together, it has a pivot tube through the middle. Part of the design freshen-up has been to change the greasing system so it has the correct orientation to supply grease more easily to the point where the force and load is; ensuring equipment longevity. On a whole, it is virtually impossible to find any flaws or faults with the redesign process that has resulted in the new Calibre Performance Package. 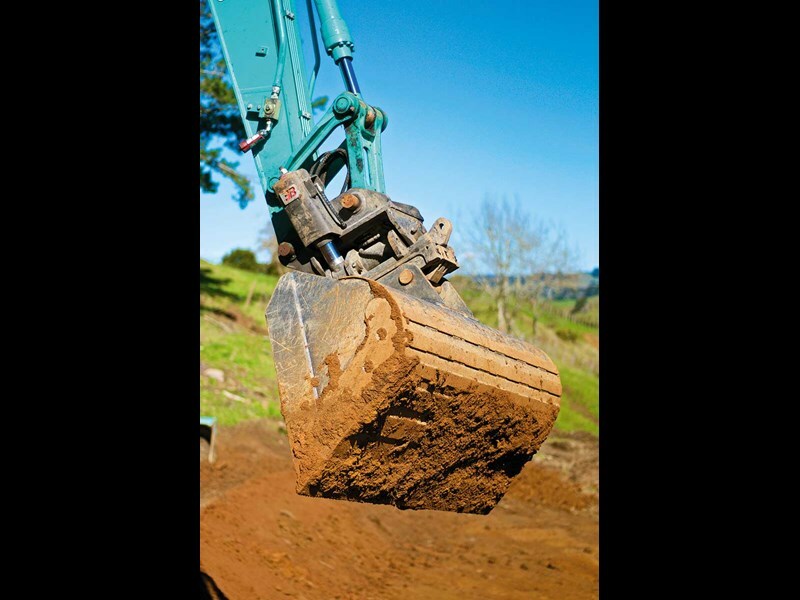 JB Attachments have taken something that was already tried, tested and popular, making it that much better through extensive research, testing and feedback—which shows the passion and commitment they have for the earthmoving industry. I think N&J Wood have made a good, experienced decision by putting the Calibre Performance Packages on their machines and would encourage anyone to put one on their consideration list, whether it’s for a new machine or even an older one. 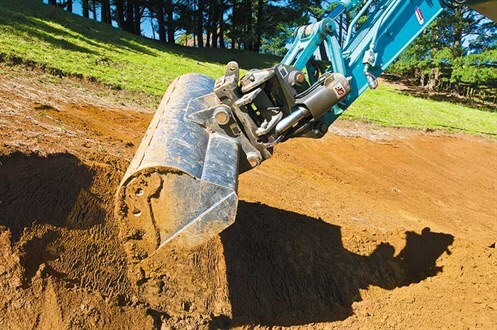 Check out the Calibre Performance Package from JB Attachments in this short video.